Mclaren M23 Formula 1 car by Schuco Toys. Grand Prix car of the early 1970s. Mention the toy maker Schuco, and many will think of their fabulous tin-plate toy racing cars based on the 1930s' Mercedes Benz racing cars. The car shown here is altogether later in design, and is predominantly made of plastic, with just the base plate made of metal. 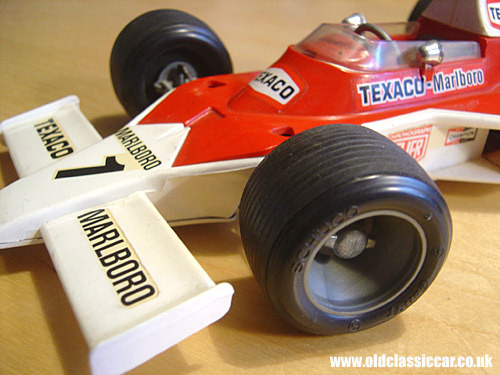 More of a model than a toy, this Formula 1 car, based on a Mclaren design of the early 1970s, measures 11 inches in length and features not just working steering, but also working coil-sprung suspension on all four corners. 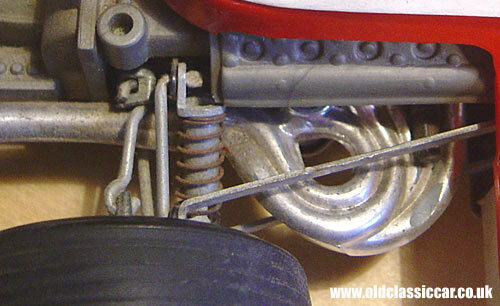 As with the earlier Schuco toys, the Mclaren features knock-on wheels. I believe this model is of the M23 Mclaren racing car, a design first launched into competition in 1973, driven by Denis Hulme and Peter Revson. 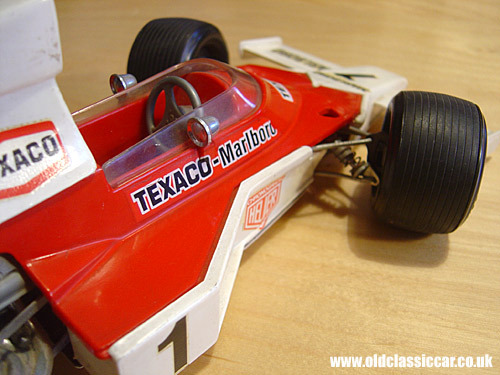 These early appearances saw the M23 finished in Yardley colours, it wasn't until 1974 that the scheme shown here, red and white liveried with Texaco-Marlboro sponsorship, was introduced. The drivers in the '74 season were Emerson Fittipaldi, driving alongside Hulme who was now competing in his final season of F1. Fittipaldi would go on to win the title that year in the M23, and continued driving it the following season, paired up with German driver Jochen Mass. 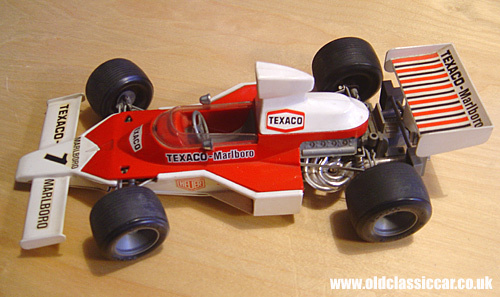 In 1976 the car would take James Hunt to World Championship success.